COOPERTOWN, Fla – Established in 1974, Everglades National Park continues to be a monumental environmental staple. Located in the South Florida, the calm-moving shallow water is known for its protected ecosystem and wildlife. Beginning near Orlando and extending across to the southern tip of the Florida peninsula, the Everglades is not only known for its river of grass, as author and environmentalist Marjory Stoneman Douglas labeled it almost a century ago, but also for cacti and muhly grass. 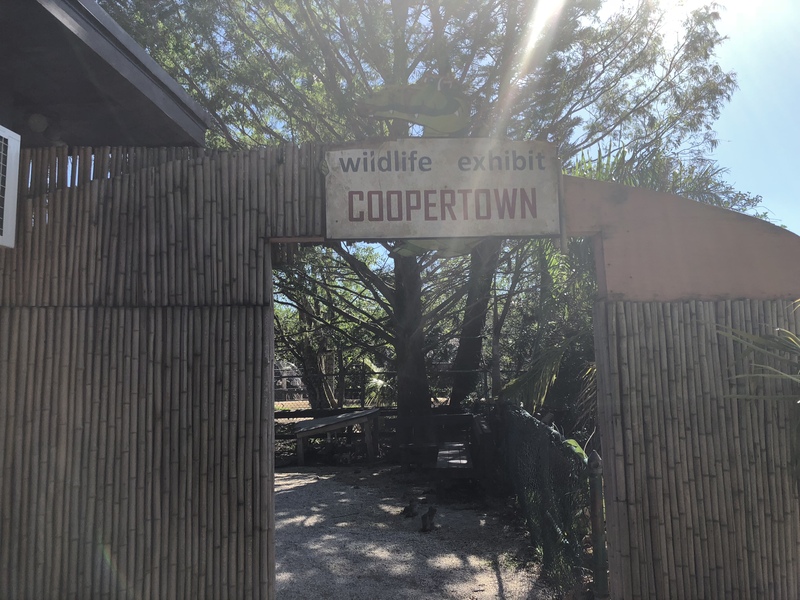 The entrance to Coopertown’s wildlife exhibit (Photo by Kalema Meggs). Living in Florida, you never know when you will come across an alligator, but being in the swampy, murky waters of the Everglades, the endangered species has made the Everglades its nesting ground for centuries. In 2015, there was an estimate of 1.5 million alligators in the state of Florida, according to Shark Valley Park Ranger and Supervisor Phillip Greenwalt. “The estimate was given to the state of Florida so we believe the majority of them are in the Everglades,” said Greenwalt. The Everglades is one of the largest preserved areas in the country and park officials continue to monitor 15 to 20 alligator nests, which are regulated and protected. Greenwalt calls the alligators the “Looney Toon Factor,” because there has been a huge misconception about alligators. “Most people think alligators are green, but they’re not. There is not a single green alligator outside of the University of Florida mascot,” said Greenwalt. The crocodile is green and endangered,” he added. Surprisingly, alligators are brown. There are different species of alligators. Two familiar are the Chinese and the American alligator. For Greenwalt, his favorite is a crocodile who found her way into Shark Valley. Greenwalt is not too sure if someone dropped the croc off, but she has been tagged by the park. With a serial number of 90827, yes, it definitely sounds like a prisoner’s number, but this helps Greenwalt and the park staff follow her every move. Crocodiles pack a huge punch, or better yet, pack a huge bite. They are stronger than alligators. A crocodile’s bite is 7,000 pounds of pressure, which is 12 times as strong as an African lion. By comparison, the alligator’s bite is a much lower 2,000 pounds of pressure. “If you were to close your jaw down right now. You would be closing it on about 200 pounds of pressure. Alligators is about 10 times more than that,” said Greenwalt. The power and strength that alligators and crocodiles embody are one of a kind, but they offer so much more than just their strength. Alligators are the keystone creatures of the Everglades. If they were to one day no longer exist, the Everglades wouldn’t exist. The alligators’ ability to adapt to their environment, especially in the dry season. There are paths going through the sawgrass which are made by them. There are solution holes that other wildlife follow, and the alligators use them to attract their prey. An alligator making an appearance for visitors on a Coopertown airboat tour of the Everglades (Photo by Kalema Meggs). Mother alligators are one of the only amphibians that will stay with their babies up to one year. What is most surprising, though, is the mother alligator is so gentle with her nest and eggs, there have been sightings at the park where mother turtles lay their eggs and keep them in the mother alligator’s nest as an incubator. The American alligator is a guard dog, so the turtle understands that no predator will come near the alligator’s nest. 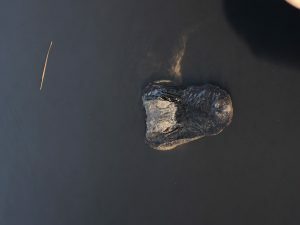 “We have witnessed alligators pick up the turtle eggs move them to the side, put their own eggs in the nest and put the turtle eggs back in the nest with their mouth,” said Greenwalt. Between the months of September and October, the alligator eggs hatch and the mother alligator takes then into the water where the baby alligators will ride on her back. She teaches her babies the basic survival skills. Alligators have multiple eyelids and the innermost one protects the alligator’s eyes and gives them clearer vision under water. This helps them survive and, most importantly, watch and attack their prey. Alligators have impeccable eyesight, which helps them adapt when hunting. They are better hunters in the water, but they aren’t built for speed. In the water, alligators use their tail as a weapon. They are blind directly in front of their mouth, however, they can see out the side of their eyelids. They hunt turtles, fish, birds and grasshoppers, but the one reptile they routinely battle is the python. However, pythons are becoming more evasive and one of the park’s most dominant species. Three to six months during the year, alligators won’t eat due to the time of season when the water is warm in the Everglades. Since Hurricane Irma has passed in September 2017, water levels have risen. This has caused some alligators to go into hiding at some areas of the park. However, wildlife has slowly begun to rebound, because there has not been as much human contact. “This was the rainiest season for us since 1931,” said Greenwalt. There is more water in Shark Valley, which is why that northern area of the park is currently closed due to the effects of Hurricane Irma. Although Shark Valley has been temporary closed, it does not mean the adventures of alligator and crocodile watching will diminish. 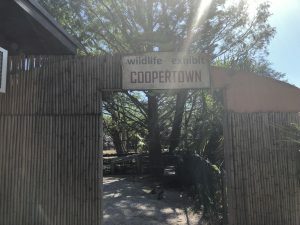 Founded in 1945, Coopertown predates the formation of the park by two years. It calls itself the original air boat tours of the park. A bit hesitant, author Kalema Meggs made a new friend with a baby (Staff photo). “This is one of our newest attractions regarding a partnership, so we hope people continue to visit the park and get to experience the different tours and shows,” said Greenwalt. Supervised by Greenwalt, he has a strong passion for national parks spaces, he’s been in the business since he was an undergraduate in college as an intern. From Versace the python, to Sassy the alligator, as a visitor of the wildlife show, you have the opportunity to touch a baby alligator, to holding the scaly, slithery Versace. And I am not talking about the designer purse. “Pythons are very aggressive, but Versace is nice and won’t bite,” said Carlos, as I gently touched Versace. The wildlife show is not the only interaction visitors can have with the animals. Directly after the show concludes, there is an airboat tour. Guests have the opportunity to ride throughout shallow water and under the sun, all while gazing at the area’s different plant life and, of course, see a wild alligator or two. Led by an airboat tour guide, visitors learn about the different alligators in the area. There is a moment when the boat stops and the tour guide tries to call the alligators so visitors can catch a close-up peek at them. Known to be some of the best hunters, alligators camouflage their bodies around their surroundings. Although the alligators are used to people being in their territory, there is a fine line between getting their attention and respecting their home. 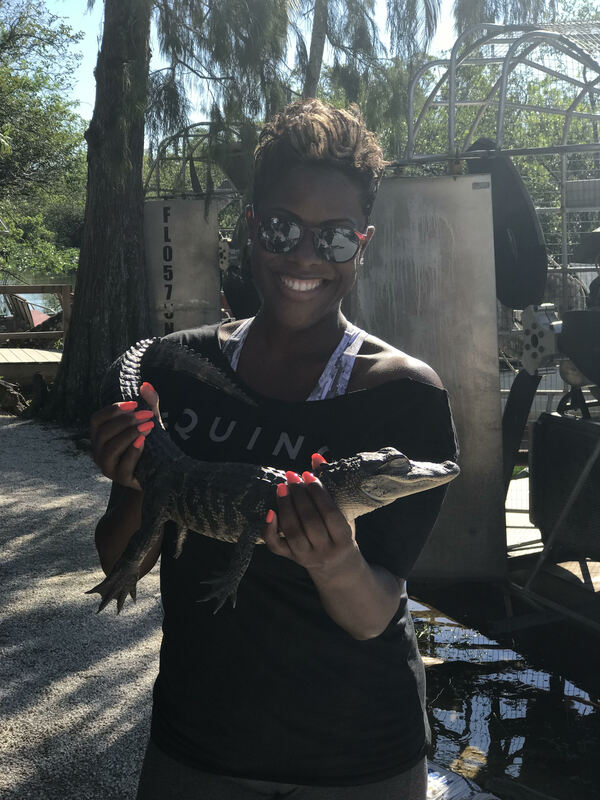 After the airboat tour, you have the opportunity to take a picture with a baby alligator. It’s free of charge, but donations are welcome. Coopertown fee: Adults: $23, child ages 7-11: $11, child under 7: free. Everglades National Park fee: Private vehicle, $25, good for seven consecutive days at all park entrances.